El Pais/YouTubeAn image of an explosion aboard a ferry docked in Playa del Carmen, Mexico, on February 21, 2018. US government employees are prohibited from using any tourist ferries in the area, according to the alert, which advised US travellers to exercise caution, purchase travel and medical-evacuation insurance, and contact the nearest embassy or consulate for assistance. The February 21 blast took place on Barco Caribe 1, a ferry owned by the company Barcos Caribe, while it was docked in Playa del Carmen. 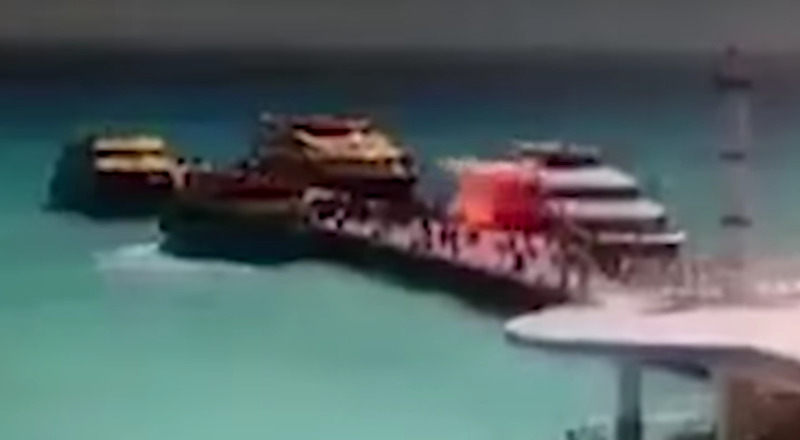 The ferry, which travelled between Playa del Carmen and Cozumel, had a 400-person capacity but was only carrying 104 people at the time of the blast, according to El Pais. 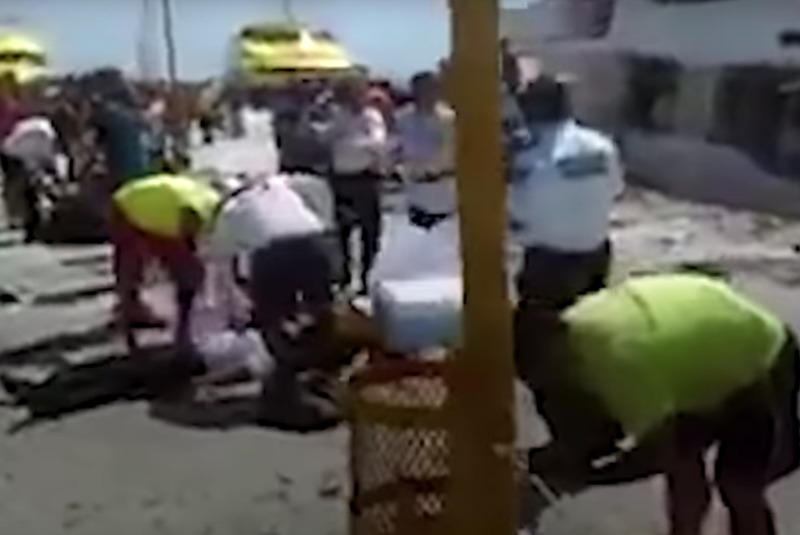 El Pais/YouTubeWounded passengers and emergency personnel on a dock after an explosion on a ferry in Playa del Carmen, in Mexico’s Quintana Roo state, February 21, 2018. State prosecutor Miguel Angel Pech Cen told Mexican media that Mexican navy divers removed the explosives and turned them over to the Defence Department for examination. Pech Cen said there was no danger to tourists because the boat was not in service and was anchored far from the dock. Pech Cen and Quintana Roo’s Tourism Department both said the Defence Department has yet to say definitively what the device was. Both boats belonged to Barcos Caribe, which is owned by Roberto Borge Martin, the father of former Quintana Roo Gov.Roberto Borge, a member of the governing Institutional Revolutionary Party, who was extradited from Panama to Mexico in January to face charges of embezzlement and abuse of public office. The state’s Tourism Department said one line of investigation is that the incidents were related to the ferry company’s internal affairs. The banner, signed by a group calling itself “El Cartel del Pumba y Tata,” claimed the attack and threatened similar acts against the home of the Perla Tun Pech, the mayor of Cozumel. 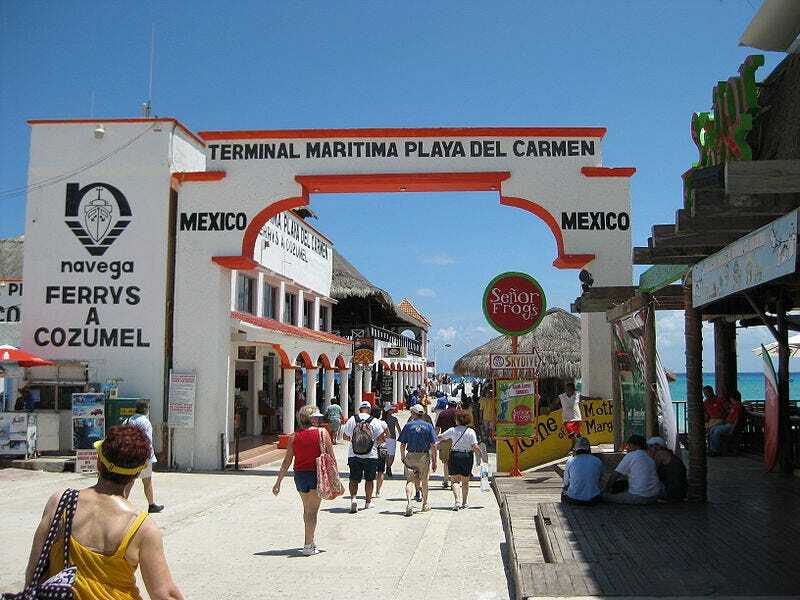 Quintana Roo, home to Playa del Carmen, Cozumel, Tulum, and other tourist hubs, has seen a considerable rise in violence in recent months, much of which is thought to be related to organised crime and drug trafficking. During a two-day period in January 2017, Playa del Carmen was marred by an early-morning shooting at a nightclub that left five dead, followed hours later by an attack on the state prosecutor’s office in the city, which left four dead. Homicides state-wide rose 117.5% between 2016 and 2017, according to government statistics. The US State Department issued a travel advisory for Quintana Roo in August 2017, though the state was not included in a January notice that issued a level-four warning for five of the country’s states, the State Department’s highest level of alert. 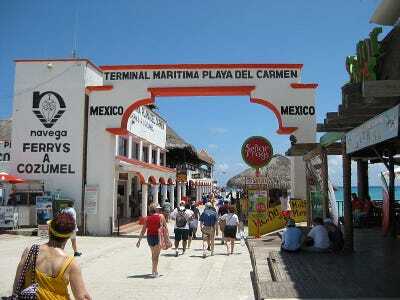 Mexico’s tourism industry brings in $US20 billion a year. Quintana Roo receives 10 million tourists a year, one-third of the country’s total.